�KITCHEN GOURMET� - Joray Fruit Rolls - Deliciously Smart Snacking! Joray Fruit Rolls are handmade daily from real dried fruit. Better yet, they come in nine delicious flavors, including Apricot, Raspberry, Cherry, Grape, Pineapple, Sour Apple, Fruit Punch, Strawberry, and Watemelon. New to the marketplace are Joray�s Fruit IQs. These fruit rolls are not only all-natural, with no added sugar, but they come in deliciously sophisticated flavors, including Apricot, Sour Plum, Tart Cherry and Cranberry. From the first sight of the orchard crate shipper to the mouth-watering taste of these intensely fresh flavors, you will be deliciously delighted with such a smart snacking option. Unlike most fruit rolls, Fruit IQ is not loaded with sugar and junk. It�s just dried fruit, fruit fiber and a few natural goodies. With ingredients this good, they don�t need to add anything else! Joray has an extensive history of family tradition. Great Grandpa George Shalhoub left Lebanon penniless and headed to America � seeking the American Dream in 1886. His dream was to pursue his passion of baking and confections and so he introduced the unique confections of Lebanon to America. He opened his first shop, George�s Bakery, and soon shared his success with his son, Joseph, and renamed the shop George Shalhoub & Son, Baker and Confectioner. As the business flourished, Joseph then welcomed his own son, Louis, to the family business. Once again, in continuing the family tradition, the business name changed to Joseph Shalhoub & Son. Louis, like Great Grandfather George, had a dream � to further share his family�s unique confections. In 1950, this vision was interrupted as Louis went to proudly serve in the United States Army, earning a Bronze Star, but still dreaming of his plans for the shop back home. Upon Louis�s return from the military, new creative items were added to their offerings. In 1960, the first fruit rolls were made. Apricot only! Little did they know how popular their fruit rolls or �shoe leather� as they were the known, would become. Always in touch with family tradition, they packaged their �shoe leather� under the brand name Joray, named after their two sons, Joseph and Ray. In 1975,the sons joined their parents and together they continued to grow Joray Fruit Rolls into what it is today. Today, these fruit rolls are still made with the same quality as they were three generations ago, having grown from one flavor to nine, and are available throughout the United States as well as abroad. 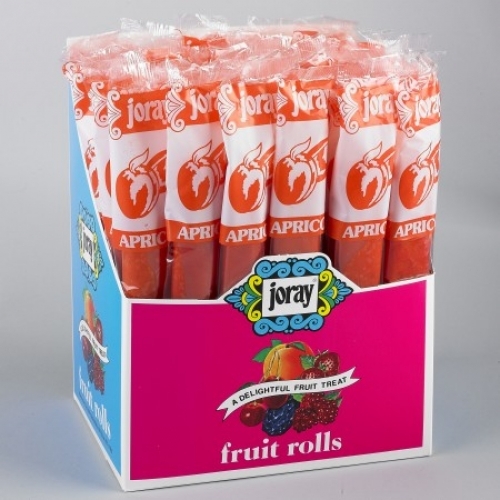 For further information on Joray fruit rolls please visit joraycandy.com.